Ellen DeGeneres surprised a superfan, who happens to be a Temple University student studying media studies and production on the Rome campus this semester. 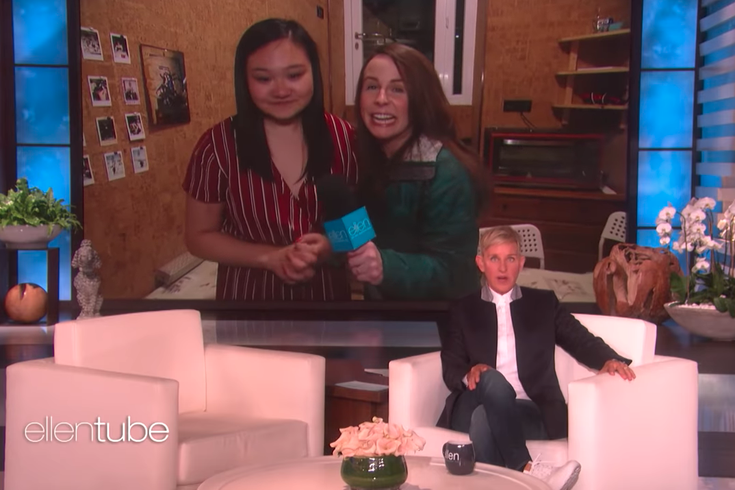 On her show this week, Ellen DeGeneres surprised a Temple University student and fan of the show, who had written the talk show host hundreds of letters since she was in third grade. Amber Mak, a media studies and production student at Klein College, is studying abroad this semester at Temple's Rome campus. So, DeGeneres sent her front-woman Jeannie to Italy to hand deliver to Mak tickets to the show and $5,000. MORE: Is 'Queer Eye' coming to Philadelphia next season? Jeannie gave Mak the tickets to see "Ellen" in addition to $1,000 from Shutterfly every time she translated a sentence from English to Italian. Her reaction to the whole ordeal is pretty hilarious and heart warming. On social media, Mak said the segment was a "dream come true" and that "not many people have the necessities to make their own dreams happen." Now, she's looking to connect with an organization to donate the $5,000 from DeGeneres, which Mak said she wants to use to make care bags for the homeless and for students. "I have been wanting to start to make backpack care packages for the homeless, as well as backpacks with school supplies for teens and kids, ever since I could remember," she said on social media.